Traditionally, machines competitive to Caterpillar have provided equipment that was a little cheaper, and a little more powerful than the comparable Cat machine. When this machine was made in 1963, the comparable Cat was an early 46A D-8 which featured 235 HP as compared to 270 HP for the HD-21. Of course, Cat soon tweaked the 46A D-8 to 270 HP, but that is another story. Somewhere along the line, Allis Chalmers bought Buda, and this machine featured an updated engine of the Buda design. Called the AC 21000 engine, one of its very best features was easy starting. Compared to the Cats of the day which still then often used a pony motor to start the main engine. This engine started quickly even in cold weather with just a poke of the starter button. Indeed it was customary with this machine to spin the engine some before turning the fuel on, just so it would start to pick up some oil before it was running. While the engine was of a modern design, alas, the transmission was not so modern. The HD21A model featured a manual transmission installed behind a torque converter sort of like the Chrysler products of the Early 1950's had. To change directions you throttled the engine down with a foot controlled decelerator (like an accelerator except you step on it to idle down) and release the clutch with a long hand lever. You then slammed the gear shift the other direction with a heavy lever about 3 feet long, and set the clutch and released the throttle. Earlier models of this machine used diesel converters in the sense that the fluid in the converter was diesel on its way to the engine. The machine shown here was one of the first with an oil converter and one of its problems was that it was always wanting to overheat. All in All, it served us pretty well. We acquired it in around 1974 and used it for about 10 years before retiring it in favor of an HD16B. 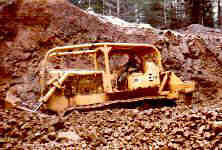 We did almost no repair work on it during that period of time which you can't always say about an old dozer. Of all the dozers of this class made over the years by Allis Chalmers (later Fiat Allis) this model was one of the more popular ones. It was really a successor to the HD-20 which was identifiable by its Detroit Diesel 6-110 engine. You see, in the 1950's and before Allis Chalmers did not make its own large diesel engines and rather usually equipped their dozers with Detroit Diesels. Most commonly, consistent with the times these were the so-called 'standard' Detroit Diesel models. The 2 cycle engine design of the classic Detroit Diesel (often called a 'Jimmy Diesel' ) dated back to the late 1930's, and until sometime in the 1960's were usually found in the standard configuration instead of the better known 'N' configuration. The latter models were different in that they had 4 exhaust valves in the head, increased compression, and an injector change. They breathed a lot better and smoked a lot less than the standard model. They also had more power. The 3-71, 4-71 and 6-71 were all to be found in old Allis Chalmers dozers. In Detroit Diesel speak, the first number is the number of cylinders and the second number is the displacement of the cylinder in cubic inches. Thus the 6-71 is an engine consisting of 6 cylinders of 71 Cubic inches. The 6-110, is, of course, a long discontinued model from Detroit Diesel. The more contemporary 2-stroke large horsepower detroits feature 149 cu per cylinder displacements. These are found in off highway trucks and even locomotives. Also in the 1980's DD produced an 8V92 series for linehaul trucks. The "V" as you might guess implies that it is a V8. The first release of them had heating or should I say cooling problems and caused a lot of grief. Later they produced a 'water below the port' model which apparently worked as a truck engine by never found its way into the dozer market. Buda, of course tried its hand in the truck market, and for a number of years way back when marketed their engine for the highway truck applications. Cooling problems caused the effort to fail. Truckers that used to run them told me that their failure occurred on western mountain passes. It was reported that they would run fine all the way to the summit, but then if you didn't stop and let the engine idle for a few minutes to cool out, the rapid cool down that would occur if you just roared over the summit and went onto compression down the other side would crack the heads. This, of course, was not a problem in the dozer application. The basic engine used in the HD21 is found in 2, 3 and 4 valve configurations. In the 21 it had 3 valves per cylinder, however, in the HD16B featured on another page on the site, the same engine had only 2 valves per cylinder (and less power). On the upper end was the AC 25000 'let it all out' model with 4 valves per cylinder. 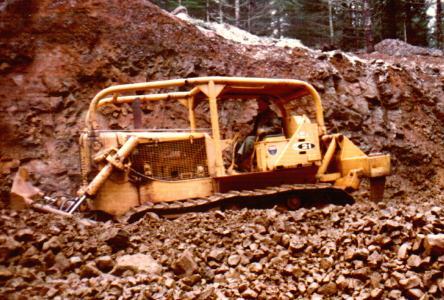 Another change in the state of the art of dozers of this class which occurred around 1960 was a conversion to the use of hydraulic blades instead of cable lift blades. One of the frustrations of this machine and its successor, the HD21P (like a 21A except with a full powershift transmission) was that the hydraulic system was not fully integrated into the dozer. The hydraulic system was simply a 'package' which bolted on in front of the radiator in lieu of the cable control unit for the blade. Because of the necessity in this configuration of running the pump off the the front belt pulley on the engine, the pump size was limited, and the blade was slow. You never needed to worry about doing 'dippity dives' with the blade. It wouldn't move that fast. If you needed the blade up you needed to think about that quite a while before you needed it that way or else you would need to stop and 'rev' the engine to get it up. As the machine got older the and pump became more worn the problem became more pronounced, especially after the oil got warmed up. It was not until the 1970's which Fiat Allis produced the "B" series dozers that they actually integrated the hydraulic system into the dozer and provided a transmission driven pump which could be of a size big enough to really be satisfactory. Large machines are typically not made in large volumes, and machine redesigns from the ground up are rather rare. Instead they sort of redesigned them a piece at a time. 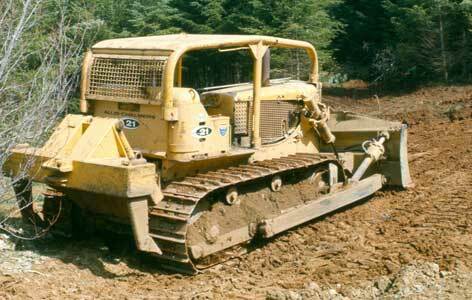 Actually looking back one can say that the basic bulldozer design as been fairly stable for 50 years or more. The transition to hydraulic lift blades and automatic transmissions have probably been the two biggest changes in half a century. While this is not to say that there have not been improvements in performance and reliability over 50 years, those changes have clearly been incremental. The creeping change has been a subtle 'horsepower inflation' of the models. 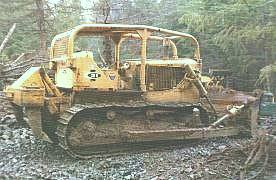 For example, the Caterpillar equivalent of the HD21 is the "Cat D-8". This model originated before World War II and the model number appears to have been a code for a "Diesel 80 Horsepower" tractor. The D-8 of today is well over 300 hp, and it got that way 10 or 20 hp at a time. While there is nothing wrong with this, one needs to understand being as 'big as a D-8 Cat' doesn't mean a whole lot. All in all these were far better machines than anyone ever gave them credit for, but Allis Chalmers never outgrew their reputation of the 1940's for pulling out their final drives and today its Fiat Allis successor is almost invisible. See also Other Machinery Index for other heavy machinery. The ripper is what is known as a '2 barrel' ripper. It is of a parallelogram design however the angle of the teeth cannot be adjusted. If you have a '4 barrel' ripper, the upper arms of the parallelogram are hydraulic cylinders and you get the best of both worlds. --- You get the functionality of a parallelogram ripper---that holds the tooth angle now matter how far in the ground it is, along with the benefit of a hinge ripper in that you can adjust the angle of the teeth. The other 'after market' item on this dozer is the 'Medford canopy'. The machine predates federal regulations for ROPS (roll over protective structures), but the Medford canopy (made by Medford Corp. of Medford Oregon) was in fact designed to survive a roll over. The Oregon logging code had long required canopies and that the canopies have 'sweeps' --- the latter being the tubes going forward to the front of the machine. The Oregon code was for a brush guard however and had no strength requirements. Manufacturers sold these machines without any canopy at all, not even an umbrella to keep the sun off of you. Current rules are moving toward fully enclosed cabs, but a Medford Canopy and a seat belt saved many lives. It is not often that these machines are rolled over, but when they are, without some protection the result is nearly always bad.